Companies have launched several handsets in the premium smartphone range. OnePlus, Asus and Xiaomi sub-brand Poco had launched three great smartphones in the market. OnePlus 6T, Zenfone 5Z and Poco F1 have been introduced with better features. Their starting price starts at Rs 20,999. But for those of you, which phone is better for you, we are giving you this information in this article. Let us know that all three are good smartphones in their respective segments based on the features. 5G update: Oneplus has reported from its official site that OnePlus 7 will not get 5G update support. But oneplus has reported that a new device will bring new name to 2019, which will be 5G update support smartphone. OnePlus 6T is launched in three memory variants. Its 6 GB RAM and 128 GB storage variant costs Rs 37,999. At the same time, the price of 8 GB Ram and 128 GB internal storage variant is Rs. 41,999 and 8 GB RAM and 256 GB storage variant costs Rs. 45,999. 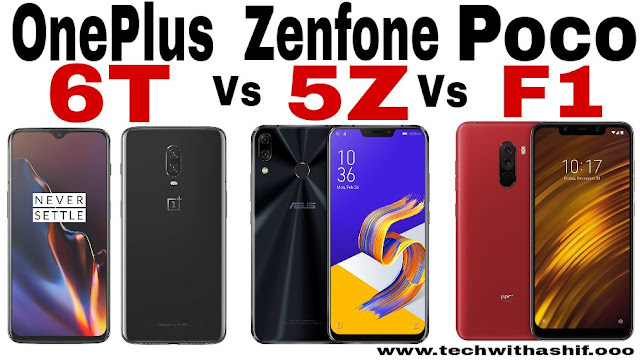 The Zenfone 5Z 6GB RAM and 64 GB storage variants will prices Rs 29,999, 6GB RAM and 128 GB Internal storage for Rs 32,999 and 8 GB of RAM and 256 GB Internal storage variants will be priced at Rs 36,999. Poco F1's 6 GB RAM and 64 GB storage variant costs Rs 20,999. At the same time, the price of 6 GB RAM and 128 GB Internal storage variants is Rs. 23,999 and 8 GB and 256 GB Internal storage are priced at Rs. 28,999. Zenfone 5Z has a 6.2-inch IPS display. At the same time, OnePlus 6T has a 6.41 inch AMOLED display. Its pixel resolution is 2340X1080. The display of Corning Gorilla Glass 6 has been given on its display. Talking about Poco F1, it has a full 6.18 inch full screen display. Its aspect ratio is 18.7: 9. Also its pixel resolution is 2246 x 1080. Zenfone 5Z 2.7 GHz Qualcomm Snapdragon 845 is equipped with octa-core processor. It also has 6 and 8 GB RAM. Apart from this, storage variants of 128 GB and 256 GB are also available. At the same time, the OnePlus 6T Qualcomm Snapdragon 845 is equipped with chipset. It has 6 and 8 GB of RAM. Plus 128 GB and 256 GB internal storage is provided. Talking about the software, it works on Android 9 Pie. The skin of the oxygen OS is given on it. At the same time, Poco F1 has a Qualcomm Snapdragon 845 processor with 2.8 GHz. The phone has 6 and 8 GB of RAM. Also, 64, 128 and 256 GB of internal storage is provided. It works on the Android Orio 8.1. OnePlus 6T has a dual rear camera. Its primary sensor is 16 megapixels. It has Sony IMX519 sensor with f / 1.7 aperture. At the same time, a 20-megapixel secondary sensor with the Sony IMX376K sensor and f / 1.7 aperture has been given. Also there is a 16 megapixel front camera with Sony IMX371 sensor EIS and f / 2.0 aperture. 4K video recording can be done in this phone. Zenfone 5Z has a dual rear camera with 12 megapixels and 8 megapixel setup. At the front, the Artificial Intelligence based 8 megapixel camera has been given at the front. There is a dual rear camera in Poco F1. Its primary sensor is 12 megapixels with f / 1.9 aperture and dual pixel autofocus. At the same time, secondary sensor is 5 megapixels with f / 2.0 aperture. With this, 20 megapixel front camera is also available. Speaking of Zenfone 5Z, 3300 MAH batteries have been given to power the phone. OnePlus 6T has a battery capacity of 3700 mAh. The company claims that it has 23 percent more battery backup than OnePlus 6. Poco F1 has a battery of 4000 mAh which supports Quick Charge 3.0.